Sit together like on a bench but without the inconvenience of not knowing where to put your drink. 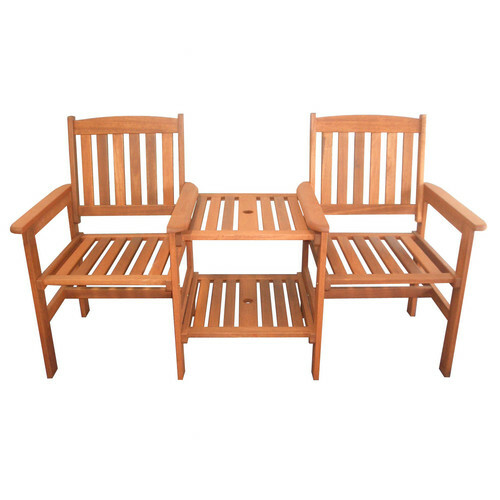 The Botany Hardwood Double Chair is more compact than a set of two chairs with coffee table and it always looks neat as the chairs will never be all around your outdoor area. This timber double chair perfectly fits a lookout point and comes with an umbrella hole for creating cooling shade (umbrella not included). The Botany Hardwood Double Chair is a perfect alternative for a bench for those who like to have storage space for their drinks and books. Colour variations may occur due to the natural nature of this shorea timber. This is the look and appeal of shorea timber and not a blemish or lack of quality. Shorea is a hardwood grown in Malaysia. Its properties are similar to teak, but it is much stronger and heavier. The strength and durability of this magnificent wood makes it the wood of choice for light construction and veneers. Shorea also has a natural resistance to decay and insects. It is strongly recommended that you treat the hardwood with an application of UV resistance wood/teak oil before leaving it exposed to the elements. This helps to protect it from stains and spills as well as giving it an overall richer appearance. For maximum protection, especially in extreme weather conditions, cover your outdoor furniture or store away when not in use for long periods. 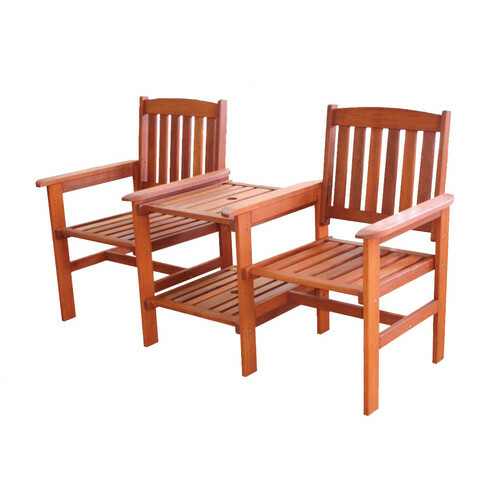 When you buy a Botany Hardwood Double Chair online from Temple & Webster in Australia, we make it as easy as possible for you to find out when your product will be delivered to your home in Melbourne, Sydney or any major city. You can check on a delivery estimate for the Breeze Outdoor Part #: 89505 here. If you have any questions about your purchase or any other Outdoor Benches product for sale our customer service representatives are available to help.Whether you just want to buy a Botany Hardwood Double Chair or shop for your entire home, Temple & Webster has a zillion things home. This is a great seat we have this on our front verandah and receive complements on how great it looks.